Chicken Pot PieComfort food at its finest! This Chicken Pot Pie recipe is a firm staple meal in my house. It is loved by both my husband and my kids alike. It is so tasty and delicious…perfect for those cold winter nights. Best of all – you can freeze the chicken mixture in advance, and it can be turned not just into a pie, but add some pasta and you have a fancy pasta dish! In a heavy based saucepan, fry off the garlic, onion and bacon until cooked through. Add the chicken mince/breast and cook for about 3 - 4 minutes or until cooked through. Roughly dice and return to pot. Stir in the frozen vegetables and the milk and the grated cheese, cook for about 5 - 7 minutes or until the vegetables are tender (stir often). Dissolve about a teaspoon of cornflour in a tablespoon of warm water to make a paste and add until you get the desired consistency - like a thick soup. Pour the mixture into a Pie dish and add the puff pastry. Cook in a hot oven for about 20 minutes or until the puff pastry is nice and brown. 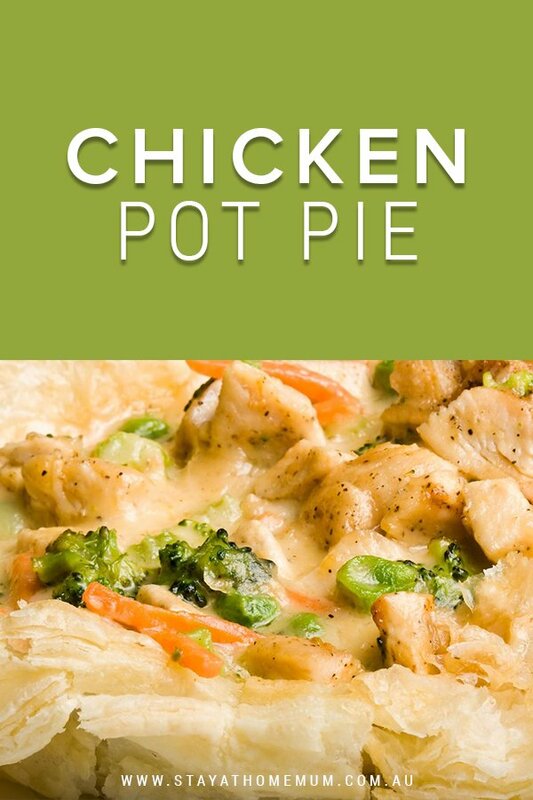 The Chicken Pot Pie mixture can be frozen (minus the pastry). Seal in a ziplock bag for up to three months. Chicken mince can be used instead of chicken breasts.